Are Declaw Procedures (Onychectomy) Inhumane? Well, that depends largely on how the procedure is done and what attention is given to pain management before, during, andafter the procedure. Historically, onychectomies were done using verylittle anesthetics and the ones that were used had poor analgesic properties at best. So, yes, once upon a time they were horriblyinhumane. Unfortunately, there are a few places that may still do theseprocedures in that out-dated fashion. However, we have come a long way and the procedure no longer has to be inhumane. Cats that have been declawed with maximized pain management techniques may be significantly less painful than they were historically. At Friendships Springs Veterinary Care we do just that so our post operative declaw patients do not have to wear collars, do not have to be bandaged for pain, andthey can rest comfortably. Many times they can receive visitors withinhours of the end of the procedure which is something that never wouldhave happened years ago. Before having onychectomy for pet cats, we do encourage clients to consideralternatives to onychectomy (declawing) before making a decision to dohave this procedure performed on their cats. 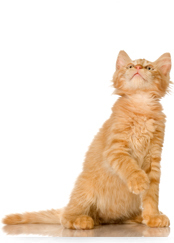 Understanding thatscratching is a normal feline behavior, and one means by which cats tomark their territory and that it is also used for claw conditioning("husk" removal) and stretching activity is important. Training cats to scratch only on appropriate surfaces and implements, such as scratching posts, cardboard boxes, lumber or logs, and carpet or fabric remnantsaffixed to stationary objects is possible, and we are happy to discusshow to do this. Appropriate claw care (consisting of trimming the claws every 1 to 2 weeks) will help to prevent or reduce injury or damage tohousehold items. Cat owners can also consider use of temporarysynthetic nail caps, such as SoftPaws to prevent human injury or damageto property; these are usually applied every 4 to 6 weeks. Several factors make this possible. We us an anesthetic/analgesic program called pre-emptive, balanced, multimodal analgesia. Basically, this means we start treating for pain before we do anything that causes pain. This "head 'em off at the pass approach" is much more effective at lessening pain than allowing pain to start and then trying to catch up; many times we can't catch up if the pain has a tremendous head start. So, we begin by giving a combination of class II narcotics, dissociative analgesics, alpha 2 agonists, benzodiazipines, short and long-acting regional nerve blocks, and gas anesthesia before surgery starts. During surgery the patient continues to get gas anesthesia as well as continuous rate infusions of narcotics, locals, and dissociatives. At the end of the procedure we give longer lasting narcotics and oncethe patient is fully awake we start them on non-steroidalanti-inflammatory medications. These last two drugs will be continued for a few days. Another factor that really increases our level of pain control is our surgical methodology. When nerve endings are cut with cold steel scalpels the nerve endings are left open which increases pain. By using a carbon dioxide surgical laser we are able to seal raw nerve endings as they are incised, thus further reducing pain. The laser also reduces the post operative incidence of infections by burning off bacteria on the skin surface as the incisions are made. Finally, we are able to make smaller incisions and smaller surgical wounds because of the laser's ability to make more discrete incisions without "tugging" and micro tearing the skin the way even the sharpest scalpel does. This improves healing time and causes less pain. We only ever do two feet at a time; we will never, under any circumstance, perform this surgery on all four feet at one time. The reason for this is because we cannot provide sufficient analgesia for all four feetwithout using medications above their safe levels. In the event thatyou wish all four feet declawed, we will do this for you, but we willonly do two feet at a time. If you would like more information, pleaseask us. A four night hospital stay is required for all cats undergoing this procedure. This requirementis to help reduce complications associated with too soon a return toactivity on feet that have had recent surgery. Again, these requirements are NOT negotiable. If you have any other questions about declaw procedures please let us know. We are happy to discuss this with you at any time.